This articles explains Flights, which are used to organize your content and information. When you create a flight, you will be able to focus on that information in different ways based on which view you are using. In any view, clicking on a flight will open the Flight Details Panel. 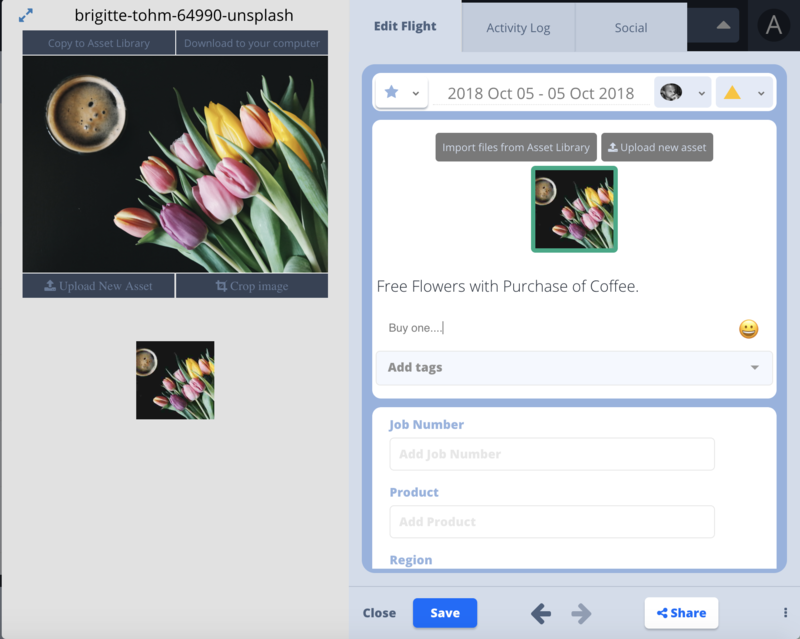 The Flight Details Panel allows you to see all information related to the flight, as well as utilize collaboration functionality and access modules like the Social Publisher. The Panel is broken into multiple Tabs, available to users based on the role and enabled features for the Account. Status: Clicking the Status icon (symbolized by a triangle) allows the user to select from the Status values configured by the Administrator. Attached Asset files: Users can drag and drop files into the Flight to attach them, or click on the Add Asset button within the Asset preview section to attach them using their file explorer. Assignee: Users can assign the flight to any user within the Campaign associated with the flight. This will alert them that they have a new flight assignment, as well as helping you use filters to keep track of who owns the next action item related to a flight. Custom Fields: Custom Fields can be configured by the ATOMIZED Account Administrator to allow the storage of Text, Number, or URL values, for easy entry and access within the Flight Details Panel. Tags: Tags allow users to associate a label to the flight for the purpose of identification or to help include other relevant information with the flight details. 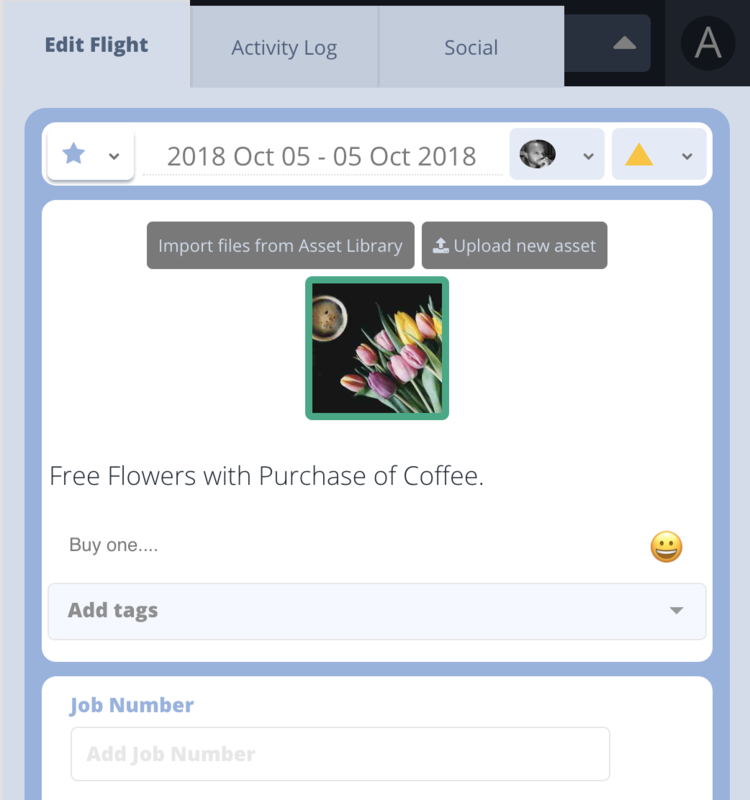 For a full list of all changes ever made to the flight since it was first created, the Activity tab will allow users to identify who completed certain milestones (like moving a flight from Pending to Approved), as well as who helped to contribute to the content in ATOMIZED. Users can leave comments and view other comments left by their team members. Users can also use the @ character to mention their teammates directly, which will also result in the mentioned user receiving a notification. If they click on the notification, they'll be directed to the flight they were mentioned in. Collaborating is easy!